A circle of piercing and a line of Island Indigo under the sentiment add detail and I gave that naughty cat a butterfly to bat at - but rest assured no butterflies were harmed in the making of this card! My own cat, Tuppence, is a fiend for eating small flying creatures and actually ate a wasp the other day. I panicked all afternoon but she didn't appear to suffer any adverse reaction! When my children were small they all enjoyed the Beatrix Potter books and definitely identified with her naughty mice, cheeky squirrels, bold cats and foolhardy rabbits! One of our favourites was the Tale of Mr Jeremy Fisher and they would always squeal with delighted horror when the frog says: "I will eat a butterfly sandwich and wait till the shower is over". I still say that now if it's raining and I want to go out, although naturally I've never actually eaten one! PS. No-one did the washing up and hoovering of course - better do it now! Absolutely charming. His little tail on the banner is so cute - and the pop of Coral is perfect! Great card Vicky... I've tasted fried grasshoppers in Mexico, (needed copious amount of tequila to wash them down) but I don't fancy butterflies! Very sweet card, Vicky. 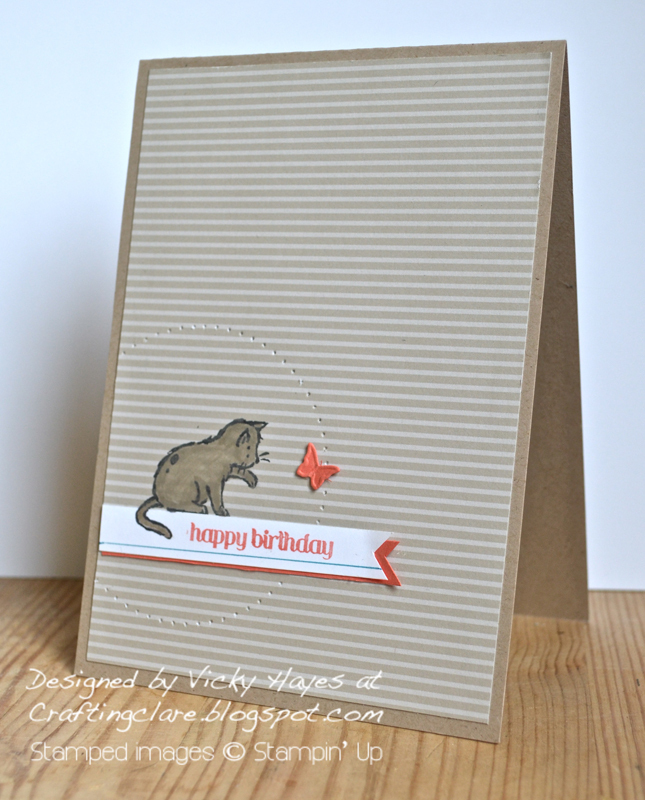 The little kitty looks great stamped on the DP, just lovely. Thank you for joining us at ATCAS. So adorable Vicky, I love his little swishy tail! Gorgeous Vicky, love how the tail drapes over the banner. Nobody would do my washing up or hoovering either! I don't mind hoovering but I really hate dusting!! What a pretty puss Vicky, mine's in disgrace. Lovely choice of colours too. Love this Vicky-Its little Tuppence on a card ! Fabulous layout i love the kitty stamp and the placement of your little butterfly is perfect ! So SUPER cute!!!!! Love your creativity! This little kitty is so adorable! Thanks for joining in at Addicted to CAS! 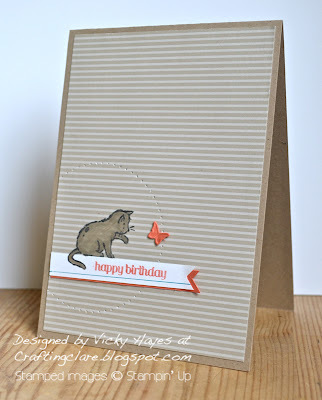 Adorable card - it's all in the detail! Your little kitty is having fun... even if the butterfly isn't!! Such a cute card and I love the pierced circle. This is very cute! Love how the tail goes down onto the sentiment banner! Thanks so much for playing along with us over at CAS-ual Fridays! Fabulous as always Vicky. Love your cats tail dangling over the sentiment. Love everything about this card, so well done! Thanks so much for joining CAS-ual Fridays this week, Vicky!